Consumer electronics, arguably dominated by only foreign companies, the Gliese Magic Air Purifier is like a breath of fresh air. We had never heard of Gliese ourselves when we stumbled upon it by chance. We were surprised to see the number of reviews and favorable ratings. That’s when we decided to take a closer look and review it. Although, the origin of their technology is not known(maybe China), still Gliese is an indigenous company. The body is cylindrical in shape which not only covers the least area on the floor, but also serves another purpose. The round design is custom made for 360° air flow and circulation. The dimensions are 21.5 x 21.5 x 33.5 cm . Interesting to note that it weighs just 1.8 Kgs ! 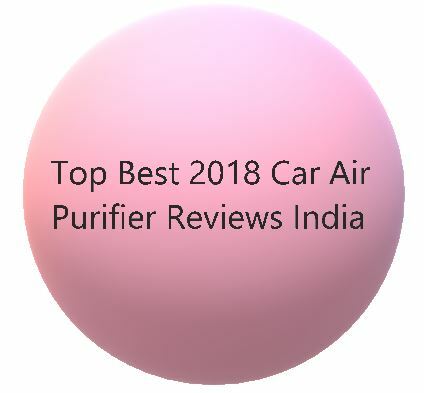 The air purifier takes the surrounding air from every angle, processes the pollutant from every side and then disperses it evenly across the room. Gliese Magic Air Purifier has a CADR of 140. Needless to say, the purifier is suited only for small rooms. Rooms sized around 200 sq.ft are ideal for its use. The Philips Ac4025 with a CADR of 147 and coverage area of 323 sq. ft is its closest rival. Even Panasonic F-PXJ30AHD with a CADR of 168 and coverage of 215 sq.ft can compete with Gliese Magic. But, the Panasonic model is really an eye-sore with terrible looks and display. Magic’s five-level air purification ensures a room free of allergens of all sorts. This unique indicator is an innovation and absent in all other brands. It indicates the estimated time left before the filters would need replacement. The unit comes with a Composite Filter (Pre-filter+HEPA+Activated Carbon) which should last for 8 – 12 months depending upon the ambient air quality at your location. Post which the filter will need to be replaced. The replacement filter is available for Rs 1,990. The Vita-Ion generator and the UV Lamp are among the 5 stages of purification, we alluded to before. The Anion generator produces negatively charged ions which are known to be mood-enhancers. Even the Kent Aura Air Purifier advertises the benefits and its usage of anions. Research has proven that anions have health benefits. Patients of depression can benefit from the negative ions. Ionizers produce ozone as a by-product. Ozone even in traces is harmful for your lungs. Like Kent models, the Ionizer can be switched on and off as per the need. The UV lamp is located below the fan. It sterilizes the incoming air and is an add-on. The Gliese Magic Air purifier has four colored lights to indicate the air quality. We like it when the air purifier is illuminated in different colored lights. It also enables easy air quality monitoring. The Real-time PM 2.5 LED gives pollutant levels in the room. Some users have complained that the PM 2.5 meter is not accurate. Another innovation is the wide number of options available to set the timer. Conventionally, we have seen just 2/4/8 hours timers in all other brands and models. It allows setting the timer from as low as 30 minutes to as long as 24 hours. Also, it shows the time remaining from a set timer. There are ample of options for setting the fan speed as well. This also counts the Auto mode. Auto Mode automatically adjusts fan speed according to room’s current air quality. So many fan speed enable you to set the function as suitable to the air quality at the moment. It also means, you save more electricity. 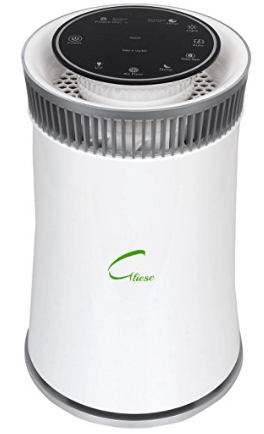 With a CADR of 130, the Gliese Compact model is the entry level air purifier. It does not have the Air Quality Indicator and PM 2.5 meter. It has 3 fan speeds and 4 levels of air filtration (i.e. Pre-filter, HEPA filter, Activated carbon filter and Anion generator). Both, Compact and Magic are suitable for room size of 200 Sq.ft. For under 4,000 it is not a bad deal at all. The Gliese Magic Air Purifier is a strong contender in the small rooms category. We really liked the looks and design of the Gliese Magic Air Purifier. 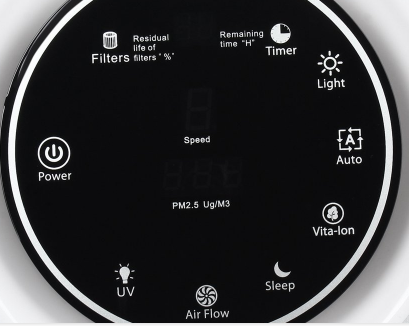 The makers have introduced innovative features like flexible timer and filter life indicator. The PM 2.5 meter may not be accurate at all times, still is a great feature. It also lends flexibility of turning On/Off the ion generator, which is good. The price is affordable and justified too. The Philips Ac4025 and Panasonic F-PXJ30AHD can also be considered. Mention the items that you bought today after getting redirected to Amazon or Flipkart through one of our affiliate links. You get cashback the very next day in your Paytm Wallet or Bank account provided you share these details with us. For Cashbacks over 100 INR you'll get cashback once the return period expires. The extent of cashback % depends on the type and category of item purchased and varies from 1 to 6%. Share the mobile number linked with your Paytm wallet. Incase you want payment in your bank account, you need to furnish the Full Name of the Account holder, Account Number, Bank name and Branch IFSC code. There is no risk of privacy or fraud when you share these details, so rest assured! Mobile Wallet is the preferred option.